From Trochta et al. 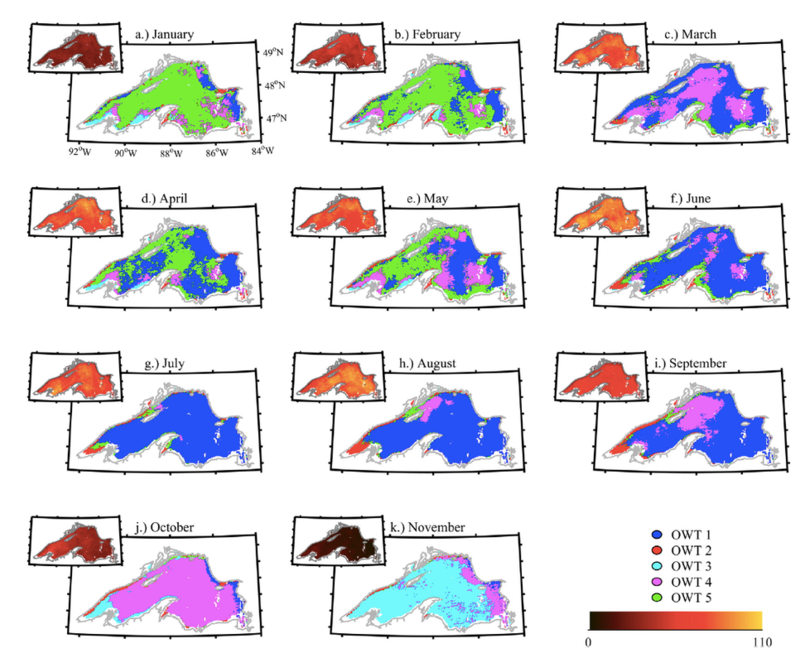 2015: Monthly maximum membership maps over the MODIS record considered for five optical water types (OWT) in Lakes Superior. The number of observations available for each month by pixel is mapped in the upper left-hand corner inlay of each monthly map. OWT assignments to pixels were determined from the most frequently represented OWT in a given pixel over that pixel's time series. The Great Lakes are one of the great natural features of our planet, an unprecedented global resource and a national asset. While these water bodies may not be salty, they are an optically complex and highly accessible laboratory for discovery. While some optical observations have been made in the lakes, the data are sparse in time and space. In addition to the paucity of data, the introduction of mussels have altered available nutrient resources, ecosystem structure and substantially altered the clarity of the lakes, impacting the optical characteristics substantially over the last decade. The overarching goal is to achieve comparable quality of remotely sensed products for the Great Lakes as is and will be available for the ocean from current and future NASA satellite missions. Harmful Algal Blooms (HABs) pose a significant health, environmental and economic risk to the Great Lakes region, given they are the largest surface freshwater system on earth and provide drinking water for more than 40 million people. The overall goal of the project is to enhance current observational and prediction tools for greater understanding of Harmful Algal Blooms (HAB) in the Great Lakes. This will be accomplished by improving satellite algorithms for the quantification of Microcystis and developing novel ecological niche prediction models of HABs. In situ observations will be aimed at detecting HAB events in Great Lakes hot spots as they initiate and to capture the environmental conditions that promote them. The in situ information collected will be coupled with remote sensing satellite data, which provide synoptic spatial coverage of bloom development. Combining these two data streams will lead to improved remote sensing detection of HABs. Data collection efforts, satellite data streams and historical environmental data will be used in the development of a novel prediction algorithm for HAB events. The improved satellite detection and ecological niche modeling will help push forward the understanding of HAB initiation, evolution and ecology that will aid in the management of human health exposure.